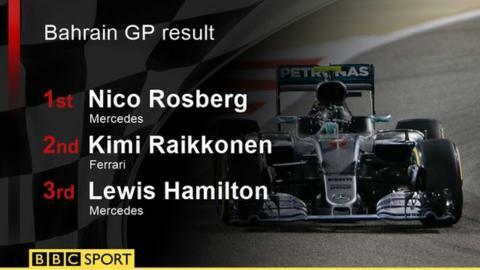 Nico Rosberg took a comfortable win in the Bahrain Grand Prix as Mercedes team-mate Lewis Hamilton fought back to third after a first-lap collision. Hamilton dropped to seventh on lap one following a slow start and a clash with Valtteri Bottas' Williams at Turn One. His Mercedes bodywork damaged, Hamilton recovered well but was unable to catch Ferrari's Kimi Raikkonen in second. The world champion may be concerned about his second poor start in as many races this season and Raikkonen's pace was further evidence Ferrari are strong enough to at least put pressure on Mercedes this year. But the race effectively fell into Rosberg's lap by the second corner as problems afflicted all three of his main rivals. In addition to Hamilton's collision, the lead Ferrari of Sebastian Vettel did not even get that far. Vettel's engine failed in spectacular fashion on the formation lap before the race had even started, so it will never be known how much of a stiffer challenge he might have mounted to the Mercedes. That was one Ferrari out of the running and Raikkonen's chances took a major hit shortly afterwards as he dropped to fifth after a poor start of his own. Raikkonen fought past Red Bull's Daniel Ricciardo and the two Williams cars of Felipe Massa and Bottas to be second by lap seven - but by that stage he was already 12 seconds adrift of Rosberg, a gap that proved too big to bridge. By the time the leaders' three pit stops were finished, Raikkonen was only 4.6secs behind Rosberg but the Mercedes driver was comfortably able to hold him off and finished 10 seconds clear. Hamilton drove impressively to move back through the field with bodywork damage that will have cost him aerodynamic downforce, but ended up 19 seconds adrift of Raikkonen. The champion's two poor starts in the first two races have effectively handed title rival Rosberg two victories, but it's coming back from adversity where Hamilton excels, and how he won his second championship in 2014 so beguilingly. "[The reason for the bad starts were] two separate incidents," said Hamilton. "Both equally painful - perhaps this one more - but we managed to recover, again damage limitation. "The team was hoping that potentially there would be a safety car. I had so much damage to the car, I couldn't fight with Kimi." Red Bull's Daniel Ricciardo took a solid fourth from fifth on the grid, and there was another impressive showing from the new US-based, Ferrari-affiliated Haas team - Romain Grosjean taking a fighting fifth after an aggressive strategy focused on running three sets of super-soft tyres and then a final set of softs. Toro Rosso's Max Verstappen, last year's stellar rookie, was a strong sixth ahead of the second Red Bull of Daniil Kvyat, who recovered from a poor qualifying performance that left him 15th on the grid to pass Massa for seventh on the penultimate lap. It was a disappointing end to a difficult race for Williams, with Bottas hit with a what some may consider a harsh drive-through penalty for the Hamilton collision, taking ninth. Stoffel Vandoorne was a solid 10th on his grand prix debut for McLaren, substituting for Fernando Alonso who was ruled out of this race by official FIA doctors because of a cracked rib sustained in his huge accident at the Australian Grand Prix two weeks ago. Vandoorne, who out-qualified team-mate Jenson Button, dropped behind the Englishman on the first lap but Button retired on the seventh lap, prompting a shake of the head in the pits at another reliability problem for the team from Alonso, who stayed on in Bahrain to help Vandoorne through the weekend.